The pine marten is a carnivorous, arboreal (tree-living) member of the weasel family. It was once widespread in Britain but now it is rare. Daily Life The pine marten is mainly nocturnal, hunting through the night and especially at dusk. It usually hunts alone. A very agile predator, it can climb trees easily, grasping the trunk firmly, digging in its claws and bounding upwards with jerky movements. The marten is one of the few predators agile enough to catch a squirrel. If it falls, its supple body twists to land safely on all four feet from as high as 20 metres! Martens, however, obtain most of their food on the ground, and they hunt for small mammals, birds, insects, berries, birds' eggs and carrion. 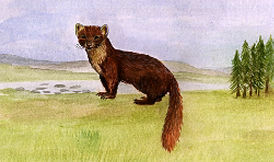 Martens are rarely seen in daylight; they sleep in dens hidden in a crevice among rocks or in hollows under tree roots. Winter Pine martens are active throughout the winter. Those that normally live high in the hills move to lower ground during the colder months. The soles of their feet are covered in thick fur which probably helps them to move across snow-covered ground. Breeding Pine martens breed only once a year, mating in July or August; the female's pregnancy does not begin until January. This is called 'delayed implantation' and occurs in other mammals too, including the badger. A litter of about 3 babies is born in late March or April, often in a nest previously lived in by a crow, magpie or squirrel. At birth, the young are blind and are covered in a thin coat of yellowish-white hair which changes to grey and then to brown as they mature. The babies spend at least six weeks in the den before they venture out and the family stays together until they are six months old.